Renovations Roofing & Remodeling, Inc. is a family owned business with its roots forming over 2 decades ago. In the beginning, the company did a little of everything from interior remodeling to roofing. As time progressed the focus was more on the exterior building envelope, and in particular, roofing. It became clear that the industry had a less than stellar image. 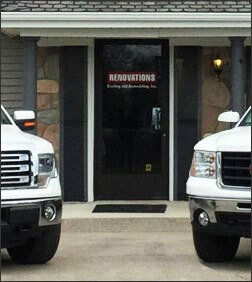 Renovations Roofing & Remodeling, Inc. decided that it was time to change that. With that in mind, the corporation was formed in 1997, and a policy of obtaining ongoing education, professional certification, and training was put into place. Currently, we are Master Certified with all of the major shingle manufacturers as well as GAF, Versico and Durolast flat roof systems. All of the management team hold builders licenses, various other professional accreditations and continuously pursue additional education. While working to change the image of the roofing industry, as well as perform better as a company, Renovations Roofing’s business began to increase dramatically. We expanded our sales and management team and added crews. We expanded into commercial roofing as well as Multi-Family residential projects. Over the last 12 years our business has increased nearly 4 fold as we continue to focus on customer service and satisfaction. That is our continued goal… to be number one in service and customer satisfaction. When you decide on a roof installation with Renovations Roofing & Remodeling, Inc., you will get a superior product. Whether you are looking for a residential roof replacement, commercial roof replacement or a roof maintenance program, we’ve got you covered. You will also discover a personal touch that is often missing in today’s fast paced roofing industry. That is because we value lasting relationships. Many of our earliest customers continue to call Renovations Roofing & Remodeling, Inc. today as a testament to our exceptional quality, reliability, and service. Contact us today to learn more about Renovations Roofing & Remodeling, Inc.